After seeing our friends return from Haiti and share their stories, we decided that it was time for us to sponsor a child with Haiti Outreach Ministries. The first step was to sign up and receive a name. Little did we know the impact our sweet Esther’s picture would have on our hearts. Each month we sent our money to help her have an education and a healthy meal each day. Although that was a great experience, we could not have expressed at that time the joy and meaning that would come when we actually MET our child when we traveled to Haiti with the church mission team this spring. Our child, Esther, is at the Cite Soleil School and is in preschool. She was absolutely beautiful! We gave a back pack with gifts for she and her family. We cannot express the feeling it gave us to see her holding her baby doll and the connection we felt. Afterwards, we were able to visit her classroom and hear the children sing and see them work. The word we felt was “HOPE”. The hope of salvation that will hopefully come for Esther and her family from being exposed to Jesus through the school and church, and the hope that education will bring to Esther and her family’s future! We will never be the same. We believe and want to act on these verses in Corinthians: 2 Corinthians 1:3-4 3 Praise be to the God and Father of our Lord Jesus Christ, the Father of compassion and the God of all comfort, 4 who comforts us in all our troubles, so that we can comfort those in any trouble with the comfort we ourselves receive from God. We are so thankful to be able to comfort and help Esther and her family because God does this for us everyday! When Chad and Katie Clark moved to Michigan and started attending church at the First Presbyterian Church of Saline, little did they know the impact they would have on their new congregation. They had been sponsoring a child while living in North Carolina before they moved and brought HOM along with them to Michigan. The couple started talking about the work going on in Haiti and the church caught the spark. Linda Kiser and Joyce Leslie were two of the many people impacted by this couple. Linda has been to Haiti five times, and on her first trip decided to sponsor a little girl named Tamara who was in 3rd grade. Tamara is now in 7th grade at a neighboring high school and working very hard to get good grades. 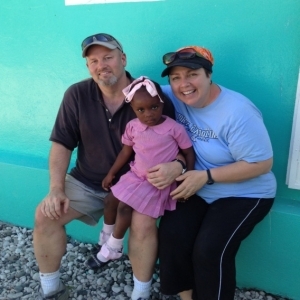 On her last trip to Haiti, Linda got to see her again and get to know her a little better. Linda is happy that she can provide Tamara with a chance at a better future through the sponsorship program. Pictured: Tamara’s little sister, Linda and Tamara. My child’s name is Gladys Elizabeth Dupree. She is 4 years old and in Pre-Kindergarten 2 (this is her second year at Blanchard). 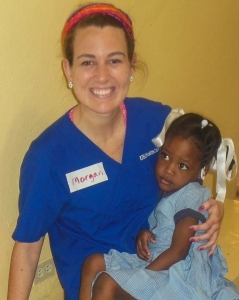 This is my first trip to Haiti and my first involvement with HOM! I decided to sponsor a child because I believe to whom much has been given, much will be asked. Maya Angelou says, “What you get, give. What you learn, teach.” Gladys represents Haiti’s future, and what better way to try to help a country move forward than by investing in their children! I got to meet her the Tuesday of my trip. The moment I saw her, I got goose bumps! I can’t wait to watch her grow up and change the world. I feel confident that Blanchard will remind her each day that she is loved and capable of doing anything she puts her mind to. I want her to be granted every opportunity possible and never want lack of financial means to hold her back! I got home and her picture immediately went up on my refrigerator. For me, Gladys represents how God manifests himself into the smallest things AND people. When I look her, I see Christ and a chance for me to be a part of something bigger than myself. I hope that as she grows older and we get to see each other (hopefully annually) that I will exhibit Christ-like characteristics that she will be able to identify (and that they will SHINE through the language barrier)! This past past April marked my fourth trip to Haiti and my second time seeing my sponsor child, Berlens. A friend and I decided to sponsor a Haitian child after my first trip to Haiti in 2009. It was on that trip that I saw firsthand the need of the people and felt God’s hand leading me to co-sponsor a little boy so that he could receive an education, a warm meal, and most importantly, learn about Jesus and what He has done for us. Through God’s providence and HOM, my friend and I now sponsor a 7 year old Haitian boy named Berlens Olivier. 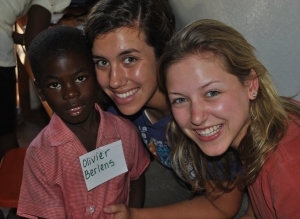 We met Berlens for the first time two years ago during his Pre-K year at Cite Soleil school. He was five years old and very shy, but we immediately felt drawn to him. His soft smile warmed our hearts and by spending a few minutes with him then, and seeing him again this past April, we were able to begin a lifelong friendship with him. Although we speak different languages, we are still able to communicate through my broken Creole (or rather the two phrases I know in Creole), high fives, and lots of hugs. Since beginning the sponsorship, my friend and I have received copies of his report cards, artwork from the students (including a Christmas tree ornament that is still hanging in my room), and Berlens’ yearly pictures. It has been such a blessing to us to be able to serve God and this little boy by sending Berlens to school. For of a small amount of money, when compared to the average American’s income, he is able to attend a great school run by wonderful administrators like Jacky Dorleans, and be fed daily, both spiritually and physically. Sponsoring Berlens has been one of the greatest experiences in my life and I am so grateful that God has allowed me to be a part of His plan in Berlens’s life.